Plans can help older doctors, lawyers stash more than $300,000. (Bloomberg) — There’s one area where the traditional pension plan is getting new life—as a tax dodge for wealthy business owners. Pensions, also known as defined benefit plans, can be used by doctors, law partners and wealth managers to stash hundreds of thousands of dollars in income a year. By doing so, they’ll get around the income limits Congress created to bar them from a generous new tax break for owners of pass-through entities, who report the firms’ income on their individual tax returns. The Treasury Department proposed regulations last week specifying who qualifies for the 20 percent deduction, which effectively slashes the top tax rate to just under 30 percent from 37 percent. The rules also say that planning techniques such as the “crack and pack”—where business owners split their firms into different entities to lower their tax bills—are considered abusive. That’s pushing top-earning service professionals to figure out other ways to get below the income limits of $315,000 if they’re married, or $157,500 if they’re single, so they can take full advantage of one of the tax law’s biggest gifts. One of the workarounds is a retirement plan more associated with union workers. Kravitz said his firm, a specialist in defined benefit plans for small businesses, is actively marketing pensions as a way for service professionals to get around the new rules. Before the tax overhaul, clients typically used them to defer paying taxes on income. Defined benefit plans are generally set up in the last few months of the year, but Kravitz said he’s already having his busiest sales year ever, as clients start new pensions called cash balance plans and boost contributions on existing plans. With a cash balance plan, participants know each year how much they individually hold. Employers make contributions according to a set formula and manage all participants’ investments collectively, usually guaranteeing a set return. The contribution limits are based on age: Generally, workers in their 30s and early 40s can pitch in less than $100,000, but limits for older workers rise quickly to above $200,000 for those in their late 50s and above $300,000 for those in their late 60s. Many large law firms and medical groups already offer cash balance plans to help their highly paid partners lower their tax bills. While these professionals may boost contributions, if possible, to try to take advantage of the pass-through deduction, the biggest potential opportunity under the new law is for the thousands of smaller businesses that don’t yet have such offerings. 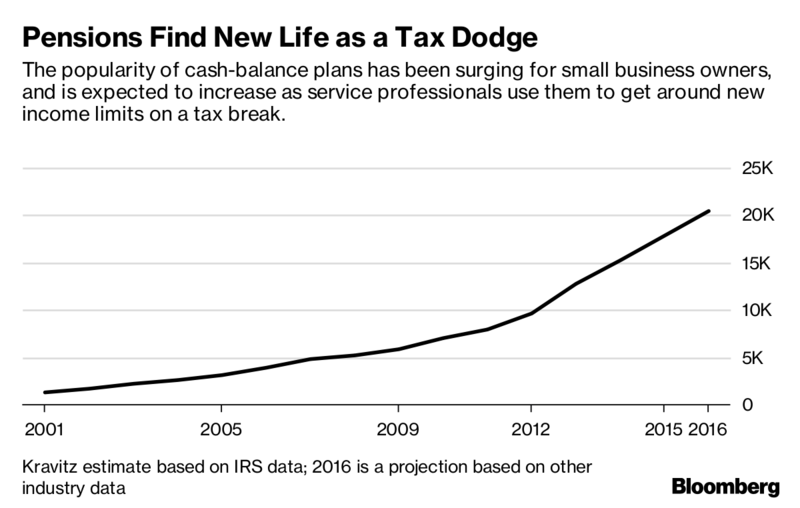 Even before the tax law, the popularity of cash balance plans was surging for small business owners. There were 20,500 such plans in 2016, up almost threefold since 2010, according to Kravitz estimates based on Internal Revenue Service data. The majority are run by businesses with fewer than 10 employees; 37 percent of plan holders are doctors or dentists, while 10 percent are accounting, finance or insurance firms and nine percent are legal firms. One of the biggest players in the space is Kravitz’s parent Ascensus, which has acquired 20 retirement service firms in recent years. The interest is a change for the traditional pension plan, which has been slowly dying after most big U.S. employers replaced guaranteed retirement benefits with less-costly 401(k) retirement accounts. Defined benefit pensions can shield more income from the IRS than a 401(k)-style defined contribution account or individual retirement account. Annual employee contributions are capped at $18,500 this year for 401(k)s and $5,500 for IRAs for those under 50. A cash balance pension is the “next logical step” for successful business owners who are already funding their 401(k) profit-sharing plans up to their limits and want to avoid taxes by deferring even more income, said Keith Steidle of Steidle Pension Solutions, a small plan administrator based in New Jersey. A 61-year-old married doctor with a practice earning $650,000 a year could set up a defined benefit pension to get his taxable income under $315,000. He could put $268,000 in a cash balance pension, in addition to putting money in his 401(k) and contributing to employee retirement accounts, and get down to an effective tax rate of 20 percent, according to Kravitz’s calculations. After several years of saving in a cash balance plan, recipients generally roll their account balance into an IRA and manage the money themselves. Most choose to do so since the IRA is a more cost-effective vehicle and they can invest more aggressively than in a cash balance plan. There’s no limit on how much users can roll over. They don’t pay taxes until they pull the money out, typically when they’re in retirement and in a much lower tax bracket. The rich aren’t the only ones who can benefit from the pension workaround. Like other retirement plans, defined benefit plans are governed by regulations, called non-discrimination rules, that require owners to spread at least some retirement wealth to lower-paid employees. The rules depend on the age and income levels in a workforce, but typically setting up a cash balance pension for a business’s owner will require a profit-sharing retirement contribution for middle-class employees equal to about 7.5 percent of their salaries. A cash balance plan can be too expensive, therefore, for larger businesses with many low earners. For small, profitable professional businesses, however, the vast majority of the benefit can usually go to owners, not employees. If the doctor’s office that brings in $650,000 employs four people earning from $21,000 to $51,000 a year, retirement rules dictate that those four employees would split an annual retirement contribution from the doctor of $13,825. Setting up a cash balance plan isn’t the right strategy for every business. Owners must be sure of stable, consistent profits before they commit to funding several years of pension contributions, said Jamie Hopkins, a professor at the American College of Financial Services. Businesses also need to make sure they’re cutting their owners’ tax bills enough to make up for pensions’ higher costs. Because of the complex rules, it can cost thousands of dollars to set up and then administer a defined benefit plan. Kravitz estimates the doctor’s office above would be charged a one-time set-up fee of $5,500 and annual fees of $8,880. Charges can be much higher for larger firms, though they can spread the costs over more partners or participants. Typically, the money is invested conservatively, guaranteeing a particular rate of return, such as 4 percent a year. For rank-and-file workers, the great appeal of a defined benefit pension is that it can guarantee a certain level of income for life. Cash balance plans effectively offer the same thing, with rules requiring them to offer a way to convert pension balances into an income stream from an annuity. While the annuity option of cash balance plans may appeal to lower earners, wealthy participants aren’t interested.